The Artillery District of Honolulu was established in 1909 and consisted of Forts Ruger, DeRussy, Kamehameha and Armstrong. The District was renamed Headquarters Coast Defenses of Oahu sometime between 1911 – 1913. Battery Randolph within Fort DeRussy was built between 1909 and 1911 and gained international, national, state and local significance at a time when British, French, Russian, German and even the Japanese had ships in the Pacific, and were expressing interest in Hawai‘i. Batteries at Fort DeRussy, including Battery Randolph and Battery Dudley, were responsible for the defense of Honolulu Harbor. In 1906, the US War Department acquired more than 70-acres in the Kālia portion of Waikīkī for the establishment of a military reservation to be called Fort DeRussy. Back then, nearly 85% of present Waikīkī (most of the land west of the present Lewers Street or mauka of Kalākaua) were in wetland agriculture or aquaculture. Fort DeRussy has evolved immensely when it was sold as a 72-acre parcel of “undesirable” land, to the building of Battery Randolph at the east end of Fort DeRussy in 1911, to the significant roles that Fort DeRussy played during WWII. The Army started filling in the fishponds which covered most of the Fort – pumping fill from the ocean continuously for nearly a year in order to build up an area on which permanent structures could be built. Thus, the Army began the transformation of Waikīkī from wetlands to solid ground. Battery Randolph at Fort DeRussy demonstrates the shift in emphasis from fortification structures to the weapons contained therein. In contrast to the stark, vertical walls of older forts, the new works of reinforced concrete were designed to blend, so far as possible, into the surrounding landscape. The low profile, massive emplacements all possess concrete frontal walls as much as twenty feet thick behind 30 or more additional feet of earth. The batteries were (and still are) all but invisible and invulnerable from the seaward direction. The permanency of construction is also evident by their present condition. In its heyday, Battery Randolph had two 14-inch guns and Battery Dudley had two six-inch guns mounted on disappearing carriages. When they were installed, they were the largest guns in the entire Pacific from California to the Philippines. The disappearing carriages allowed the guns to remain hidden from sight of approaching battleships by solid concrete walls called parapets, capable of withstanding a direct hit from a 2,000-pound artillery shell. To get the gun into the firing position, the artillery crew tripped a lever attached to a 50-ton weight. As the weight fell, it lifted the gun tube into battery (the firing position), and the gun was then ready to fire again. A crew of roughly 14 artillerymen would load a shell in the breech, and then load 340-pounds of gun powder behind it. After lobbing the 1,556-pound shells up to 14 miles out to sea, the recoil automatically pushed the gun carriage back down behind its concrete parapet; the gun was then reloaded. A well-trained crew could fire a round downrange every 30-seconds. As one round was impacting its mark, the second round was already half way in flight to hit the target again. Protecting Soldiers inside the battery, the overhead concrete was up to 12-feet thick. On the ocean side of the battery, concrete was the equivalent of 30-feet thick. These 1890s-era weapons were very accurate. Observation points on top of Diamond Head and Tantalus were used to triangulate the distance, direction and speed of potential adversaries via telephone to the plotting room at Battery Randolph. With the end of World War II came the realization that the fort was no longer capable of meeting the needs of the US military in Hawaiʻi. The giant guns were cut up and sold for scrap, having never fired a shot in anger or defense. Battery Dudley was razed to the ground; Battery Randolph was eventually abandoned and briefly became a warehouse storage facility. In 1976, the Army designated Battery Randolph home of the US Army Museum of Hawaiʻi. Today, Fort DeRussy Armed Forces Recreation Center is the home of the Hale Koa Hotel (House of the Warrior,) an 817-room, world–class resort hotel and continued favorite R&R destination for our country’s military personnel and the US Army Museum of Hawaiʻi. The museum houses a gift store that sells military memorabilia, books, clothing, military unit insignia and World War era music. The museum is funded by the Department of Defense and admission is free of charge and open to the public, Tuesday through Saturday, 9 am-5 pm, and closed on some federal holidays, but open on military holidays. 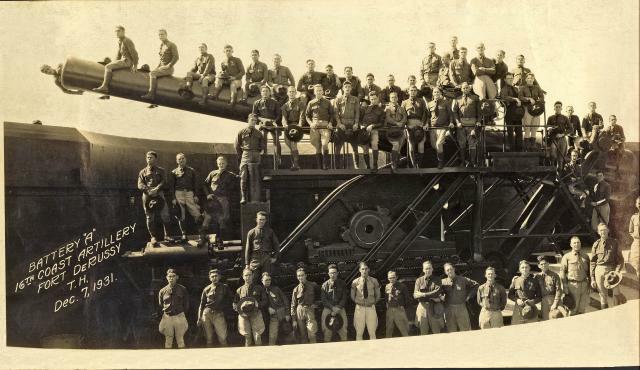 The image shows one of the 14-inch guns at Battery Randolph, Fort DeRussy in 1931 (from army-mil;) in addition, I have included other images of the Fort in a folder of like name in the Photos section on my Facebook page.